Map showing the states of the French Mandate from 1921 to 1922. The Sanjak of Alexandretta (Turkish: İskenderun Sancağı, French: Sandjak d'Alexandrette, Arabic: لواء الإسكندرونة‎ / Liwa' Al-Iskandarūna) was a sanjak of the Mandate of Syria composed of two qadaas of the former Aleppo Vilayet (Alexandretta and Antioch, now İskenderun and Antakya) and became autonomous under Article 7 of the 1921 Treaty of Ankara: "A special administrative regime shall be established for the district of Alexandretta. The Turkish inhabitants of this district shall enjoy facility for their cultural development. The Turkish language shall have official recognition". That was because of the presence of Turkic peoples along with Syriacs and Arabs of various religious denominations: Sunni Muslims, Alawites, Greek Orthodox, Greek Catholics and Maronites. There were also communities of Armenians, Greeks, Assyrians, Jews and Kurds. In 1923, Alexandretta was attached to the State of Aleppo, and in 1925, it was attached to the combined State of Syria, still with special administrative status. The 1936 elections in the sanjak returned two MPs favoring the independence of Syria from France, and this prompted communal riots as well as passionate articles in the Turkish and Syrian press. The sanjak was given autonomy in November 1937 in an arrangement brokered by the League. 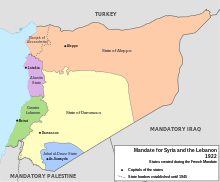 Under its new statute, the sanjak became 'distinct but not separated' from the French Mandate of Syria on the diplomatic level, linked to both France and Turkey for defence matters. According to the estimates of the French high commission in 1936, out of a population of 220,000, 46% were Arabs and among them 61 % alewives and 39 % sunni, 39% were Turks, 11% Armenians, , 8% other Christians and 4% were Circassians, Kurds and Jews. Although Turks formed the largest single ethno-religious minority, Arabic speakers including Sunnis, Alawites and Christians were more numerous. The allocation of seats in the sanjak assembly was based on the 1938 census held by the French authorities under international supervision: out of 40 seats, 22 were given to the Turks, nine for Alawi, five for Armenians, two for Sunni Arabs, and two for Antiochian Greeks. This repartition was the result of a Turkish military intervention from Payas and Hassa just beforehand, on July 5, 1938, with the ethnic cleansing of most of its Arab and Armenian inhabitants who constituted the majority of the population. Turkey had also crossed tens of thousands of Turks into the Sanjak of Alexandretta to register as citizens and vote. Moreover, the results seemed to be questionable because it happened for the sole purpose of seat repartition, and Turkish propaganda was very active among Alawis and Circassians, all of whom were considered as Turks by Ankara. According to the official registration numbers by July 22, 1938, 57,008 voters in the Sanjak were registered, belonging to the following ethnic groups. Despite the voter registration, no elections were held and an "approved" sanjak assembly was commissioned by Turkish and French authorities. Tayfur Sökmen who was appointed by Atatürk to lead the transition arrived in Antakya from Dörtyol on August 25, 1938. Protests in Damascus by women demonstrators against Turkey's annexation of the Sanjak of Alexandretta in 1939. One of the signs reads: "Our blood is sacrificed for the Syrian Arab Sanjak." On September 2, 1938, the assembly proclaimed the Sanjak of Alexandretta as the Hatay State. The State lasted for one year under joint French and Turkish military supervision. The name "Hatay" (Turkish for Hittite) itself was proposed by Atatürk and the government was under Turkish control. The president Tayfur Sökmen was a member of Turkish parliament elected in 1935 (representing Antalya Province) and the prime minister Dr. Abdurrahman Melek, was also elected to the Turkish parliament (representing Gaziantep Province) in 1939 while still holding the prime-ministerial post. The Hatay State became the Hatay Province of Turkey in 1939. ^ a b Brandell, Inga (2006). State Frontiers: Borders and Boundaries in the Middle East. I.B.Tauris. p. 144. ISBN 978-1-84511-076-5. Retrieved 30 July 2013. ^ Jack Kalpakian (2004). Identity, Conflict and Cooperation in International River Systems (Hardcover ed.). Ashgate Publishing. p. 130. ISBN 0-7546-3338-1. ^ Robert Fisk (2007). The Great War for Civilisation: The Conquest of the Middle East (Paperback ed.). Vintage. p. 335. ISBN 1400075173. ^ Bazantay, Pierre. "Un conflit de nationalités au Proche-Orient : le sandjak d'Alexandrette 1934-1939" (in French).